Cedric Jackson The Car Guy! 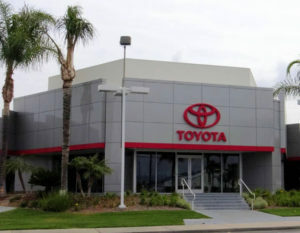 Toyota of Riverside is apart of the David Wilson Auto Group which has 19 dealerships mostly in Southern California. Eight of them happen to be Toyota Stores. If we don’t have the vehicle you’re looking for, we can get it quickly, usually same day. We sell over 500 vehicles per month and that’s why we are the #1 volume dealer in Riverside County. We have a top rated service and parts department with highly trained technicians using advanced technology to take care of your vehicle. And with a Truly Exceptional sales department you know we will do whatever it takes to earn your business.